- Highly driven and innovative business professional offering multi-state level sales, business development, distributor & key account management with industry leaders, Constellation Brands, Kobrand Corporation and Kendall-Jackson. - Developed In-Store Food & Beverage concepts inside global retailers Crate & Barrel & Restoration Hardware (RH) including impactful wine, beer & spirit consumer events. - Career portfolio includes confirmed success starting and growing wine retail business, web sales and corporate wine education, Just Grapes, in Chicago. - Recognized Corporate Sommelier and Wine & Spirits Education Trust Diploma Candidate and Certified Instructor with over 15 years of experience reaching corporate audiences and birthing countless new wine enthusiasts. - Featured in numerous news and entertainment media: the Wall Street Journal, Chicago Tribune, Entrepreneur Magazine, Men’s Journal, ABC and CBS Chicago News, and including selection and participation on the PBS series, “The Winemakers” Season II. -Highly driven and innovative business professional offering multi-state level sales, business development, distributor & key account management with industry leaders, Constellation Brands, Kobrand Corporation and Kendall-Jackson. -Developed In-Store Food & Beverage concepts inside global retailers Crate & Barrel & Restoration Hardware (RH) including impactful wine, beer & spirit consumer events. -Career portfolio includes confirmed success starting and growing wine retail business, web sales and corporate wine education, Just Grapes, in Chicago. 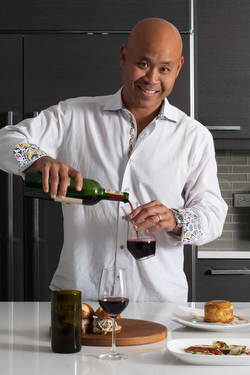 -Recognized Corporate Sommelier and Wine & Spirits Education Trust Diploma Candidate and Certified Instructor with over 15 years of experience reaching corporate audiences and birthing countless new wine enthusiasts. -Featured in numerous news and entertainment media: the Wall Street Journal, Chicago Tribune, Entrepreneur Magazine, Men’s Journal, ABC and CBS Chicago News, and including selection and participation on the PBS series, “The Winemakers” Season II.